Anyone who has kids (or eats!!) knows that stains are inevitable. They happen to the best of us. For me, the worst stain I ever got was dropping a Swedish meatball on my Wedding dress at my Wedding. I was sooooo angry. Of all the things to get a stain on. Luckily, it was not very noticeable (except to me) and I still had an awesome day!! 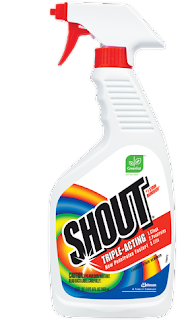 Shout has come out with some terrific products to help those poor unfortunate souls stop the stains before they are there forever!! I was sent four of their products to try. 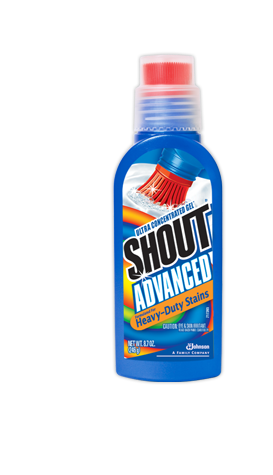 Shout Ultra Gel Brush is for those really ground in stains. You know the ones that you have tried to wash out, and they won't go away. Dirt is a big one, or even marker. With the built in brush, you can really penetrate the dirt!! 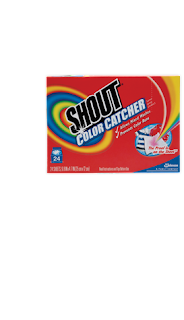 Now two of their new products that I hadn't tried yet are their Shout Wipes to Go, and their Shout Color Catcher. 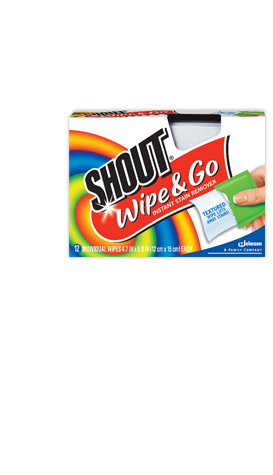 With the Wipes to go, you can take care of stains when you are no where near a washer machine. We always seem to get the worst stains when we are on vacation. Last month the boys gained chocolate stains all over their white Avengers shirts while eating smores camping!! Now with the Wipes to go, you just wipe down the garment, and set it aside until you can wash it. These are perfect to fit in your purse and carry with you anywhere. With the Color Catchers, even if that dreaded color gets in with the whites, you are all set to prevent pink clothes!! These are also a money/time saver when you only have half a load of whites and colors, and you don't want to do two loads!! Shout is also running a great contest right now, that I just entered!! Show off your kids’creativity to win a Shout®Prize Pack! Enter to win by submitting a photo of your kids creating a game with just their imaginations, three elements and permission to play. 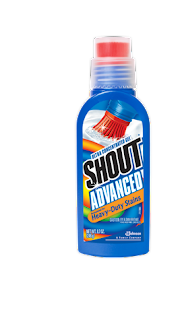 Our Facebook fans will vote for their favorites to award Shout®Prize Packs to five (5) new winners every week. Each Shout®Prize Pack consists of Shout®Trigger Triple Acting Formula, Shout®Advanced Ultra Gel Brush, Shout®Wipes, Shout®Color Catcher, a $25 gift card and a vintage Shout®t-shirt. The Shout®Unstructured Play photo contest is open only to legal residents of the 50 United States or District of Columbia (“D.C.”), 18years of age or older as of date of entry. The contest begins June 4, 2012 at 12:00:00 a.m. (midnight) Central Daylight Time (“CDT”). The Contest Period is divided into four (4) Entry and Voting Periods. Each Entry Period will run from Monday through Wednesday except for the first EntryPeriod, which will run from Friday through Sunday. Each Voting Period will run from Thursday through Sunday. I entered my boys. You can see their photo here, and if you like it, please vote for them!! I am very excited to offer one of you the same products I got!! You can fight those stains along with me!!! my new work shirt i made for my business!!! My favorite t-shirt got a stain on it thanks to my 2 yr old. It was hopeless.